Smiling Elephant is my absolute favorite Thai restaurant in Nashville. There's always some debate on which place has the best Pad Thai, and Smiling Elephant has won that honor at least once, but for vegans, it has to be the best spot in town. The restaurant is on 8th Avenue, just south of Wedgewood and the Belmont area. I don't think I've ever been there when it wasn't packed with a line out the door. Part of that is because the restaurant is so tiny, but the other part has to be that people just love it. Smiling Elephant has a really cool vibe- there's a genuine Thai food cart that greets you when you enter, and behind it you can see the chefs cooking in the kitchen. With such a small space, you are really jammed into your spot with the next table close enough to participate in your conversation, but it doesn't bother me. For all its popularity and even with all the people waiting, service is very quick, and super friendly. Normally the owners help do everything from ring up orders to bus tables, and everything in between. When you order you can specify that you're vegan and want to leave off any eggs, fish sauce, shrimp powder, and meat. I've never had an issue with an order getting mixed up or someone not understanding what I meant when I asked for vegan. 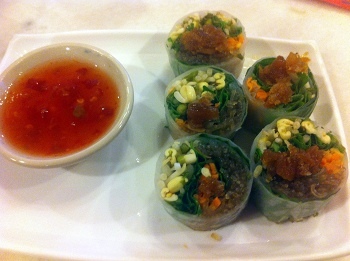 We almost always start off our meal with the fresh rolls, which are unlike the typical Asian, Thai-style rolls. They cut them in pieces like sushi rolls and cover them with a pickled vegetable that is so good we fight over who gets to scoop up the stragglers that get left on the plate. In 2012 they introduced a new fresh roll that has basil and peanuts and gives a nice new take on what has to be a restaurant favorite. 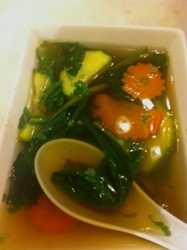 We also really enjoy the lemongrass soup, which comes in a cute bowl and has fresh slices of carrot and bok choy in it. For entrees, we've tried pretty close to everything that can be veganized. The servers are very familiar with dietary restrictions, so all you have to do is mention that you're vegan and don't want any eggs, milk, or shrimp paste. They can make their famous pad thai for you, with fish sauce left out. And, when I don't feel like having tofu in place of meat in a dish, I just ask for more vegetables instead. I've even substituted extra vegetables into a noodle dish that doesn't typically come with it. There never seems to be a problem with substitutions. My only qualm is that sometimes I wish I had more noodles in my dishes. I like the concept of more vegetables than anything else, but I love rice noodles and want to be able to soak all the flavors up with plenty of carbohydrates. We've only tried Smiling Elephant's desserts once, mainly because we are usually pretty full when we leave, but also because we didn't realize any of them were vegan. 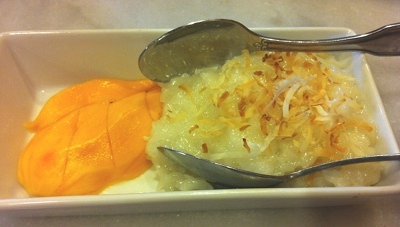 This is their mango sticky rice, made with coconut milk and a little sugar, and then topped with toasted coconut. It's really light and flavorful and the perfect way to end the meal, if you have room.